On March 12, 1969, Promoter Ed Francis put on another outstanding card at the Civic Auditorium. The card featured two tag team matches, a grudge match, and the main event: a Texas Death Match between Professor Tanaka and Tex McKenzie. In the first tag team match, Lord Blears and Tosh Togo defeated the team of Rocky Montero and Harry Fujiwara on a disqualification. 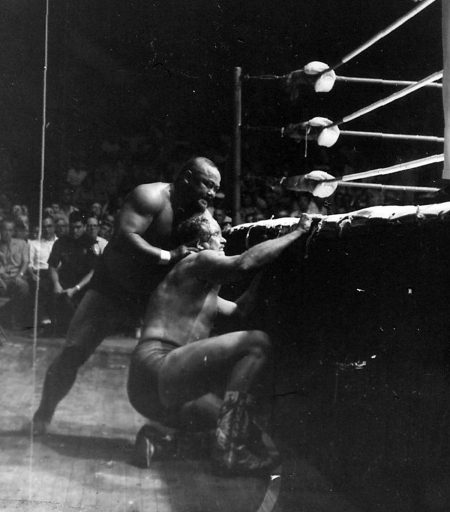 The next match was a grudge match between Wahoo McDaniel and Curtis Iaukea. The match was 2 out of 3 falls. 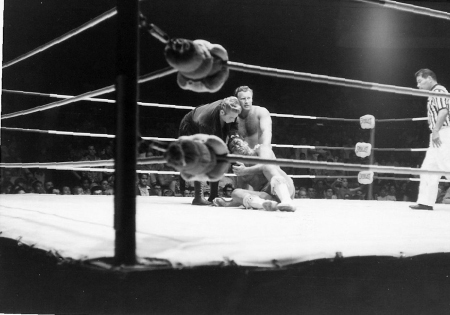 McDaniel won the first fall on a disqualification after Iaukea rammed McDaniel's head into the steel post outside the ring. Iaukea won the second fall with an elbow drop in the time of 2:35. Shane and Bockwinkel attend to an injured Wahoo McDaniel. For the third fall, McDaniel went into a mad rage and started throwing punches, chops, kicks, dropkicks, and finally pinned Iaukea with a flying tackle to win the third fall and the match in 1:30. This caused Iaukea to hit McDaniel in the back of the head with a chair and caused McDaniel to fall to the mat and he gegan to bleed profusely and even though he won the match, McDaniel had to be carried from the ring on a stretcher. McDaniel leaves the ring on a stretcher. The next match was for the Hawaiian Tag Team Championship, with champion Ripper Collins & Luke Graham defending their titles against the team of Nick Bockwinkel & Bobby Shane. The first fall came in 5:00 when Collins pinned Bockwinkel using his atomic drop and a press. 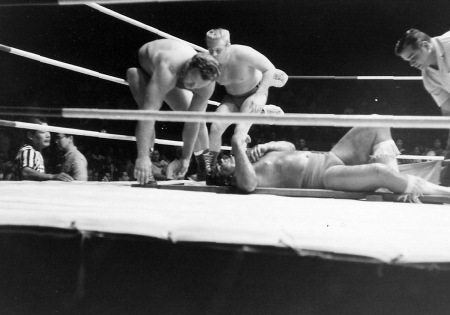 Bockwinkel evened up the match by using an abdominal stretch successfully on Collins, who submitted quickly. Graham tries to prevent Bockwinkel from pinning Ripper Collins. The third fall lasted 5:50, Graham picked up Bockwinkel for a body slam when Shane ran in from behind and dropkicked Bockwinkel's back and Graham fell to the mat with the weight of Bockwinkel. Referee Wally Tsutsumi counted to three and Bockwinkel & Shane were the new tag team champions. Graham holds Shane back from tagging Bockwinkel. The main event was a Texas Death Match which is a wrestling bout with no rules. There is no time limit, no disqualifications, anything is allowed, should there be a pin fall, there will be a one minute rest period, and at the end of the period the refereee counts to 10. If the loser of the fall is on his feet, the match goes on. If not, the match is over and the man on his feet wins. Tex McKenzie clubs Professor Tanaka on the back of the neck. 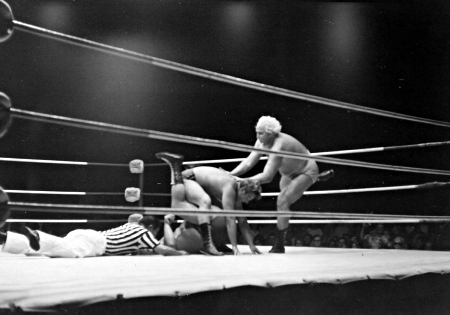 The wrestlers for the match were Tex McKenzie and Professor Tanaka. the winner of the match would meet North American Champion Gene Kiniski in the future. The match lasted the total of five falls. Tanaka won the first fall in 25 seconds. After the rest period, McKenzie struggled to get on his feet. For the second fall, Tanaka went to throw salt in McKenzie's face and McKenzie took the salt away and threw it into Tanaka's face and then pinned him in 1:47 seconds. The third fall went to Tanaka in 1:25 after pinning McKenzie on the cement floor outside the ring. Tanaka also won the fourth fall by ramming McKenzie's head into the turnbuckle and pinning him in 1:47. Tanaka bashes McKenzie's head into the side of the ring. Now with four falls completed, McKenzie was bleeding from the forehead and managed to get back into the ring for the fifth fall. In this fall, McKenzie lost his temper and removed his boot which he used to smack Tanaka in the head. 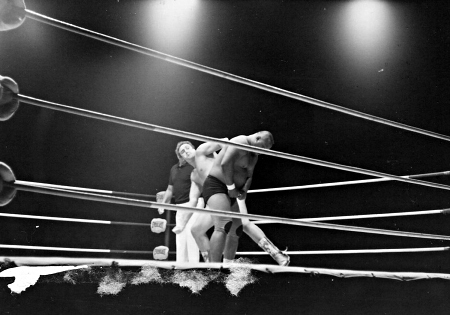 McKenzie dragged Tanaka outside the ring and ran his head full speed into the wooden panneling on the far side of the Civic Auditorium. Tanaka's head began to bleed and McKenzie pinned him outside the ring near the women's restroom. 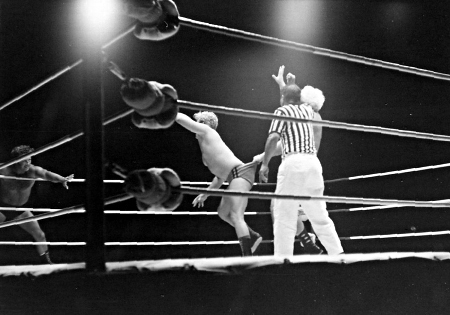 After the fall, McKenzie returned to the ring and the referee began to count to 10 for Tanaka to get up return to the ring. Tanaka made an attempt to return to the ring but couldn't make it back in time and McKenzie was declared the winner of the match.